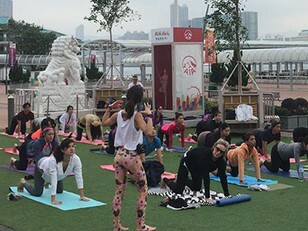 AIA Vitality Park at the Hong Kong Observation Wheel is a brand new wellness area at the iconic Central Harbourfront which promotes fitness, exercise and a healthy living. The Yoga Room is a boutique yoga studio in the heart of Sheung Wan with four studios. The Yoga Room offers over 100 classes per week designed for the beginner to the advanced. The Yoga Room is proud to offer group classes in Hatha, Vinyasa, Hot Yoga, Hot Flow, Yin & Candlelight Yin, Yin Yang, Ashtanga, Yoga Therapy, Restorative Yoga, Warm Stretch, Gentle Flow, Detox Yoga, Yoga Nidra & Meditation, Mindfulness Yoga, Core, Inversions, Hammock Yoga, Wheel Yoga, Forrest Yoga, Zumba Dance, Pre-natal Yoga, Pre-natal Pilates, Mum & Baby Yoga, Kids Yoga, Mat Pilates and TRX, all taught by Certified instructors. With a focus on small classes and high-quality, personalized instructions, the teachers of The Yoga Room radiate with warmth and knowledge from their extensive and diverse training. The Yoga Room also offers many Yoga teacher training, workshops, retreats and outdoor events. With over 1500 hours of training under belt, Ariel is forever a curious student. She is an E-RYT500 (Experienced Yoga Teacher at 500-hr level) with Yoga Alliance US, and a Certified Jivamukti Yoga Teacher, and has been teaching yoga since 2009. She is also a Reiki Master Teacher, teaching people how to apply Reiki healing energy in their everyday lives. Starting with vinyasa yoga, her focus in recent years has been on teaching Yin Yoga, Jivamukti Yoga and reminding people of their spiritual nature. Feeling deeply thankful for her advanced yin yoga training with the founder of Yin Yoga Paul Grilley, intensive training with Jivamukti Yoga's co-founder Sharon Ganon, and various trainings with Tiffany Cruikshank, Anatomy Trains in Motion, CranioSacral Therapy and Taoist Abdominal Massage (Chi Nei Tsang), Ariel is now blending all that she has learnt across different disciplines into her own trainings and classes. Her teaching is a delicate balance of effort and grace; functionality and spirituality. At 2017's Evolution Asia Yoga Conference, she felt honored to assist Jivamukti Yoga's co-founders Sharon Ganon and David Life. From 2015 to 2017, she was a lululemon ambassador. She has also been featured in various magazines such as Harper's Bazaar, Hong Kong Tatler, U Magazine and MOVE. You will also see her teaching and/or performing at various yoga festivals and conferences. The dream life she is living now is quite a long way from her economics and finance background. She is deeply grateful for the teachings and inspirations from her teachers Paul and Suzee Grilley, Sharon Ganon and David Life, Tiffany Cruikshank, Sarah Powers, Janet Lau, Janice Clarfield, Reiki masters Chantal Phillips, Isabella Summers and Matt Shum, and all the students she has the honor to share her practise with.